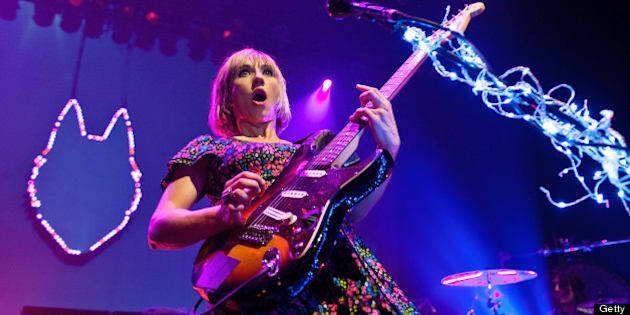 Ritzy Bryan, leader of Welsh rockers The Joy Formidable, isn't the only female rock guitarist out there, but she is one of few commanding stadium-sized audience of late. It's a bit sad really that in 2013 girls with guitars are still rare enough to warrant special notice, but there is small comfort in the fact that googling Bryan reveals more people looking up her guitar rig than whether or not she has a boyfriend. "Well, I couldn't play the flute. The harp was too big. The violin too much of a nuisance to those around me," she tells HuffPost. "The guitar was the obvious choice really because I was really passionate about it at a young age. I'm quite self-taught on electric guitar, though. I've put in lots of hours in my bedroom. I never did that with singing — no hairbrush practice in front of the mirror." As a vocalist, Bryan is a powerhouse. It's one of the reasons The Joy Formidable (which also includes Rydian Dafydd on bass and drummer Matthew James Thomas) can hold its own as opening act for bands like Muse and the Foo Fighters: their whole sound is larger than life. On the band’s latest album, "Wolf’s Law," they've super-sized the mix of '70s prog, '80s dream-pop and ‘90s alt-rock that put them on the map in 2011 with the appropriately titled "The Big Roar" and its hit single "Whirring." Playing outdoor festivals will also allow the band to indulge in its penchant for that most sprawling of rock genres: prog. As for her position as role model for young women musicians, Bryan says it’s important to support them without making too much of a big deal of gender. “I don’t want to ever be too patronizing, because sometime it just becomes a marketing angle. But there are some really great female players and bands out there, and we share their stories," she says.